Locate “Settings” icon on the screen of your Apple tablet and tap it. In the opened window tap “General” located on the half-left of the screen, this will toggle the half –right of it where you can find “Use Side Switch to” options. Return to Home screen by pressing Home button which is the physical hardware button located at the bottom middle part of the device ( or by using five-finger gesture, which is preferable way). Now look on the position of the physical switch at upper-right edge of the device. When this switch is set to Lock mode — the down position, with an orange dot visible on the switch — the screen will not rotate with device rotation. The visible indication of it is a small Screen Rotation Lock icon in the status bar just near the battery charge icon. When this switch is set to UnLock mode — the up position, small Screen Rotation Lock icon in the status bar will disappear and iPad will respond to rotation. Double-press the Home physical button located at the bottom middle part of the device. This will bring up the multitasking bar. It may be empty or with icons of recently used apps. Tap Padlocked icon in the multitasking bar if you want to unlock rotation mode. On devices running iOS 7 the rotate-screen icon (for plane design this term is more precise than button) is nested inside Control Center that can be accessed by swiping up from the bottom of the screen. So locking / unlocking the rotate mode , say on iPad Air, involves procedures similar to above ones except the very first two steps: instead of going to multitasking panel you should reach Control Center and find the rotate-screen-lock icon there. Mind you, this icon comes up only if you set iPad's physical switch to Mute / Unmute mode . 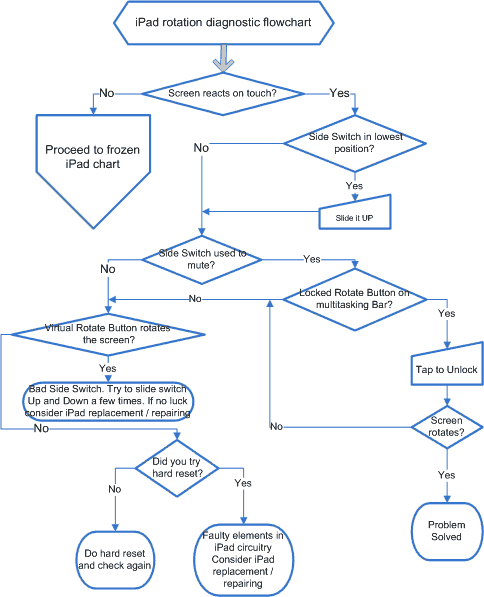 If you have followed the instructions on this page but iPad screen rotation is not working try a few more actions before applying for replacement / repairing.First shut down then, in 30 sec, turn ON Apple tablet and follow iPad Rotation Diagnostic FlowChart to pinpoint the problem. Mind you, sometimes when the screen is not rotating, it is not iPad's fault but rather the trait / flaw of some specific app running on tablet. To check it, close that app with not rotating screen and try rotate the Home screen itself.